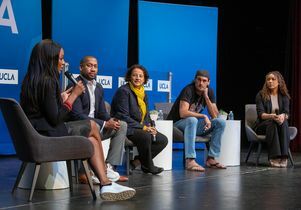 ESPN anchor and UCLA alumna Cari Champion, left, and the panelists agreed that sports and politics have never been separate. Sports in the United States have always been political. 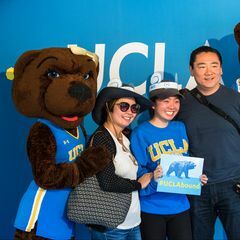 In a panel discussion Feb. 5 at UCLA, experts made that case by pointing to municipal governments subsidizing new stadiums, the racial and gender barriers to participation in sports and even the charitable causes leagues choose to support. The panelists were Pat Turner, vice provost of UCLA undergraduate education and professor of African American studies; Chris Kluwe, a former punter for UCLA and the Minnesota Vikings and now a writer and LGBT equality activist; Damion Thomas, museum curator of sports for the Smithsonian National Museum of African American History and Culture who earned a doctorate in history from UCLA; and Kaiya McCullough, a current UCLA women’s soccer player. 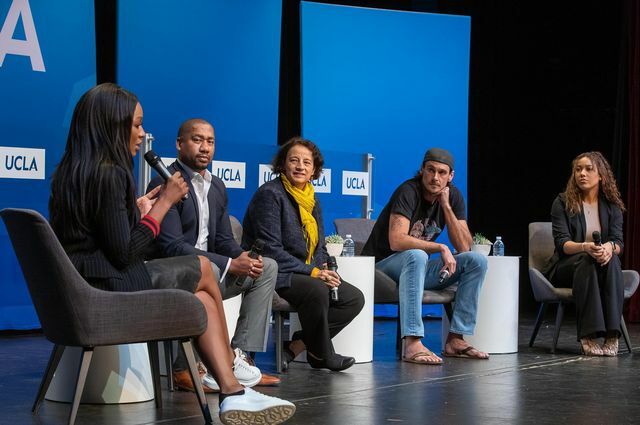 The moderator was ESPN anchor Cari Champion, a UCLA alumna. McCullough made news in 2017 when she began kneeling during the national anthem before UCLA soccer games — joining a movement that began with former NFL quarterback Colin Kaepernick as a call for social and racial justice. She said reading on social media about the repeated shootings of African-American men inspired her to take action. McCullough continued to kneel before games in 2018, and when she said that she planned to continue doing so in 2019, loud applause and cheers erupted from the crowd in Schoenberg Hall. 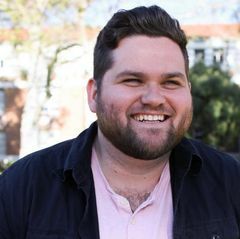 Kluwe spoke passionately about the responsibility he feels to speak out. Thomas brought some historical context to the discussion. He noted that when James Naismith invented basketball in 1919, it was to help the YMCA — founded as the Young Men’s Christian Association — instill moral and character education at a time when church attendance was declining. Champion pointedly asked the panel what might have happened if Kaepernick had said he was kneeling to support breast cancer research, rather than to bring attention to racial injustice. Kluwe said he didn’t think anyone would have had a problem with that; that it was because Kaepernick was pointing out the “ugly history of American racism” that many football fans turned against him. “Again, politics and sports are intertwined all the way,” Kluwe said. Turner said it was interesting to her that athletes’ kneeling during the anthem has been interpreted as disrespectful. Toward the end of the discussion, Thomas reminded the audience of Jackie Robinson’s legacy — and the toll that his activism took on him. Click to listen to the discussion.